Friday night is usually pizza night in our family. While I love take-out pizza and fries as much as the kids, I can’t stomach the $30 price tag that often comes along with 2 cheese pizzas, 2 side orders of fries, and cheese steak sandwich (my one treat, other than coffee). Fortunately, the kids love to help make pizza or calzones. As along as I make the dough earlier in the day, or the day before, making pizza isn’t too stressful a process. The dough can be made at the last minute if needed because it doesn’t need to rise. I prefer to make mine before picking the kids up from school. I also try to shred the cheese during the day. When I’m making large pizzas, I double the dough, and we have one pizza left over for Saturday lunch. When I made the mini pizzas, we had enough leftover for 2 lunches. I could have stretch the dough a little farther by making smaller balls and stretching out the rounds. As you can see in the picture, mine rise up quite a bit. Divide one batch of dough into 16 balls of dough or more using a pastry cutter. Shape the balls into spheres before rolling out on a floured board. If the balls are round, the pizza will roll out in a round shape. You may need to flour the rolling pin before rolling. Transfer the pizza rounds to a lightly greased cookie sheet floured with a light dusting of cornmeal. I put 4 mini rounds on one sheet. Put a thin layer of sauce on the pizza rounds and spread it around. Sprinkle cheese and desired toppings over top. Bake at 450 for about 20 minutes. Watch the cheese for doneness. Transfer to wire rack for cooling, and make the next batch. If you have 4 cookie sheets, you can make the next batch while the first one is baking in the oven. 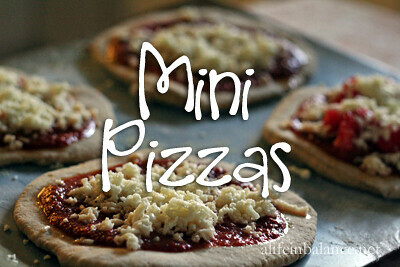 It takes about 10 minutes to make a batch of mini pizzas. 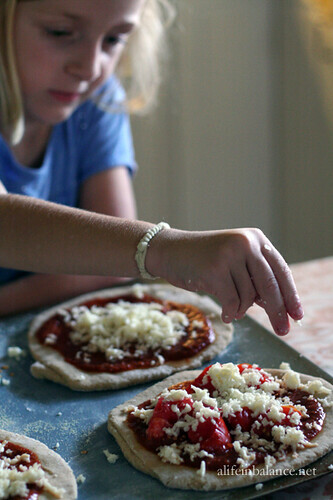 Making your own pizzas is so much fun, as well as healthier and less expensive. Thank you for sharing your deliciously easy recipe!